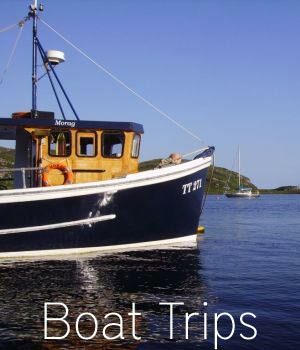 The Morag, based in Tighnabruaich, can accommodate 10 passengers and the trips invariably capture the spectacular views of the area from the sea, and give fantastic close up opportunities to see seals, porpoises, and many sea birds that inhabit the Kyles of Bute. Trips of over one hour include the opportunity to try your hand at fishing for Mackerel, Pollock, Saithe, Cod and Codling. All the necessary fishing gear is carried on board. Enthusiastic anglers can charter the boat purely for fishing expeditions and visit the best fishing grounds in the area. Tel 01700 811538 or 07799 661493. www.dcmarineboattrips.co.uk. Alternatively, Loch Goil Cruisers gives the opportunity for self drive day-boat cruising/ fishing on Loch Goil. www.lochgoilcruisers.co.uk tel 97787516709. 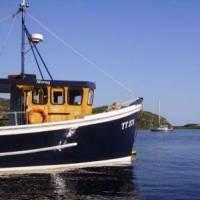 There is also excellent sea fishing in Loch Riddon where one can spin for mackerel from a pier a mile away from the cottages- or bring your own dinghy and launch it into the loch just down from the cottages.